We are just winding down our busy season of traveling and such. During this time we normally stick to the basics of schooling, which means art is pushed aside. I can tell you its always a great day when we get to incorporate art into our day! I am happy to say that with ArtAchieve it’s not so much of a struggle anymore. Over the last few weeks we have been working on the Entire Level I homeschool art program from Art Achieve. 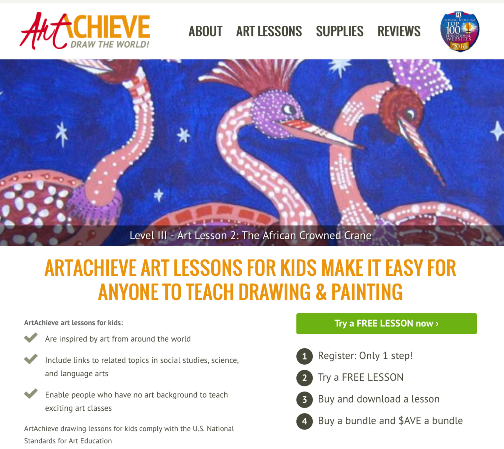 ArtAchieve is the brainchild of John Hofland, a veteran homeschooler, and is a complete homeschool art program that provides instruction in drawing for kids and adults alike. Mr. Hofland believes that anyone can learn to draw because drawing is an essential skill, just like math, and is a skill that can be taught. I can tell you that I have no artistic drawing abilities and if I can draw/paint/create then anyone can learn to create a masterpiece with ArtAchieve! Each lesson is available in two different formats for your learning pleasure, either through video or PowerPoint presentation. The video lesson guides the student through the lesson with an instructor demonstrating each and every step of the project. A quick history of the lesson is also given. The PowerPoint lessons give detailed written instructions with clear images in each stage of the project. So, it is just your preference of which one you follow with your students. Also handy is the complete list of supplies needed for each and every lesson in the level. Each project gives state standards that are covered also if that is your sort of thing to keep track of. 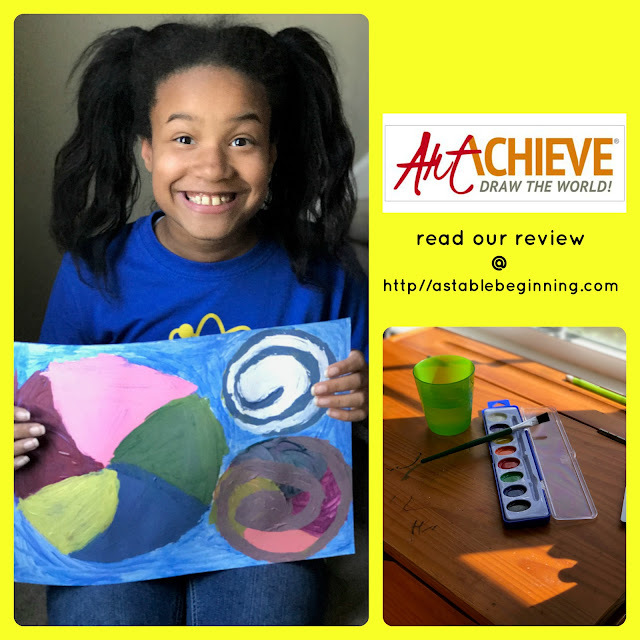 For this review I used the art program with Montana (10). Initially I planned to use it with McKenzie (7) also, but things didn’t quite line up with scheduling. Montana preferred the PowerPoint Presentation but we did view the video lessons for some of the projects too. Viewing each lesson was as easy as longing into our family account and clicking on the appropriate link for the video or PowerPoint. We did not go through the lessons in order, rather I let Montana pick a project she wanted to complete. She chose The Umbrella from Thailand and it turned out really great! She was able to showcase her creativity making her colorful umbrellas. Since we have a year subscription I plan on working these lessons into our Morning Time Recitations, which we actually do in the afternoon, so that McKenzie will be able to work through the projects too. ArtAchieve makes doing art easy and fun so be sure to check out what my CrewMates thought of this Level and the other two levels up for review by clicking the banner below.